A busy NDB Cluster writes to the binary log regularly and presumably rotates binary log files more quickly than a quiet one. This means that a “quiet” NDB Cluster with --ndb-log-empty-epochs=ON can actually have a much higher number of ndb_binlog_index rows per file than one with a great deal of activity. Adding this index provides no benefit when replicating from a single master to a single slave, since the query used to get the binary log position in such cases makes no use of orig_server_id or orig_epoch. See Section 18.6.8, “Implementing Failover with NDB Cluster Replication”, for more information about using the next_position and next_file columns. 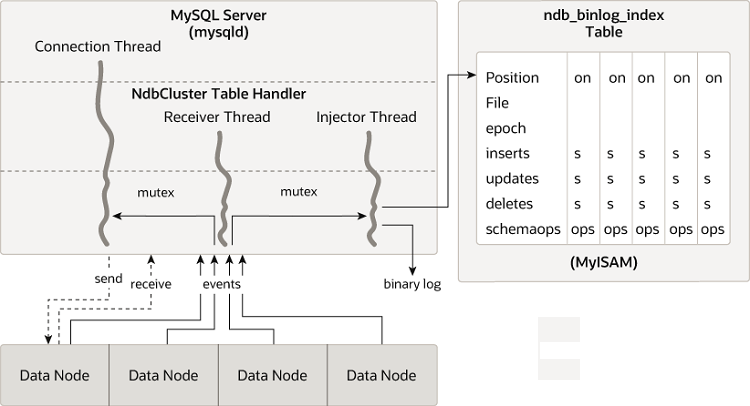 The following figure shows the relationship of the NDB Cluster replication master server, its binary log injector thread, and the mysql.ndb_binlog_index table. The ndb_apply_status table is populated only on slaves, which means that, on the master, this table never contains any rows; thus, there is no need to allow for DataMemory or IndexMemory to be allotted to ndb_apply_status there. Because this table is populated from data originating on the master, it should be allowed to replicate; any replication filtering or binary log filtering rules that inadvertently prevent the slave from updating ndb_apply_status or the master from writing into the binary log may prevent replication between clusters from operating properly. For more information about potential problems arising from such filtering rules, see Replication and binary log filtering rules with replication between NDB Clusters. The ndb_binlog_index and ndb_apply_status tables are created in the mysql database because they should not be explicitly replicated by the user. User intervention is normally not required to create or maintain either of these tables, since both ndb_binlog_index and the ndb_apply_status are maintained by the NDB binary log (binlog) injector thread. This keeps the master mysqld process updated to changes performed by the NDB storage engine. The NDB binlog injector thread receives events directly from the NDB storage engine. The NDB injector is responsible for capturing all the data events within the cluster, and ensures that all events which change, insert, or delete data are recorded in the ndb_binlog_index table. The slave I/O thread transfers the events from the master's binary log to the slave's relay log. You can also obtain useful information from the output of SHOW ENGINE NDB STATUS. This can sometimes be useful when debugging applications. When performing schema changes on NDB tables, applications should wait until the ALTER TABLE statement has returned in the MySQL client connection that issued the statement before attempting to use the updated definition of the table. If the ndb_apply_status table or the ndb_schema table does not exist on the slave, ndb_restore re-creates the missing table or tables (Bug #14612). Conflict resolution for NDB Cluster Replication requires the presence of an additional mysql.ndb_replication table. Currently, this table must be created manually. For information about how to do this, see Section 18.6.11, “NDB Cluster Replication Conflict Resolution”.